To analyze clinical, radiographic and magnetic resonance findings that might predict risk of complications and conservative treatment failure of osteoporotic vertebral fractures. 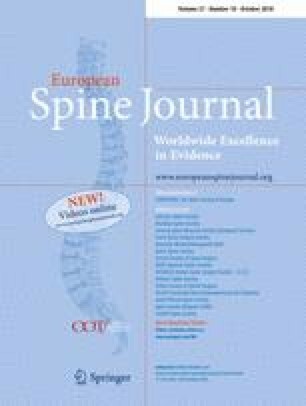 The authors conducted a systematic review of observational studies, collecting data on osteoporotic vertebral fracture and complications like vertebral collapse, kyphosis, pseudoarthrosis, and neurologic deficit. MeSH items such as ‘spinal fracture/radiology,’ ‘spinal fracture/complications,’ ‘spinal fracture/diagnosis’ were used. PRISMA statement criteria were applied, and the risk of bias was classified as low, medium, high, following the Newcastle–Ottawa Quality Assessment Scale (NOS). Eleven cohort studies, either retrospective or prospective, met the eligibility criteria and were included in the review. Major risk factors that were statistically predictive of the following complications were as follows; (1) vertebral collapse: presence of intravertebral cleft, MR T1-WI ‘total type fractures’ and T2-WI ‘hypointense-wide-type’. (2) Pseudoarthrosis (nonunion): middle-column damage, thoracolumbar vertebrae involvement, MR T2-WI confined high-intensity pattern and diffuse low intensity pattern. (3) Kyphotic deformity: thoracolumbar fracture and superior endplate fracture. (4) Neurologic impairment: a retropulsed bony fragment occupying more than 42% of the sagittal diameter of the spinal canal and a change of more than 15° in vertebral wedge angle on lateral dynamic radiography. Shape and level of the fracture were risk factors associated with the progression of collapse, pseudoarthrosis, kyphotic deformity and neurologic impairment. MRI findings were often related to the failure of conservative treatment. If prognosis can be predicted at the early fracture stage, more aggressive treatment options, rather than conservative ones, might be considered. The work has not been published before in any language, is not being considered for publication elsewhere, and has been read and approved by all authors. Each author contributed significantly to one or more aspects of the study. No benefits in any form have been received or will be received from a commercial party related directly or indirectly to the subject of this article. There are no conflicts of interest around this study. The authors have full control of all primary data and agree to allow the journal to review their data if requested.